Religious Education is central to everything we do in school. We use "Come and See" alongside other resources to encourage children to live their life following Jesus. Children are also taught about other faiths and we encourage children of all faiths to attend our school. Please look at the RE section within our Curriculum page for more information. We were inspected by Andrew Sowerby and Julie Frazer from the Diocese of Salford (Section 48 inspection) on March 22nd 2016. The school was judged to be "an Outstanding Catholic Primary School." We are delighted with the report which highlights the strengths of the school. You can the full report below or you can contact school if you would like a paper copy. 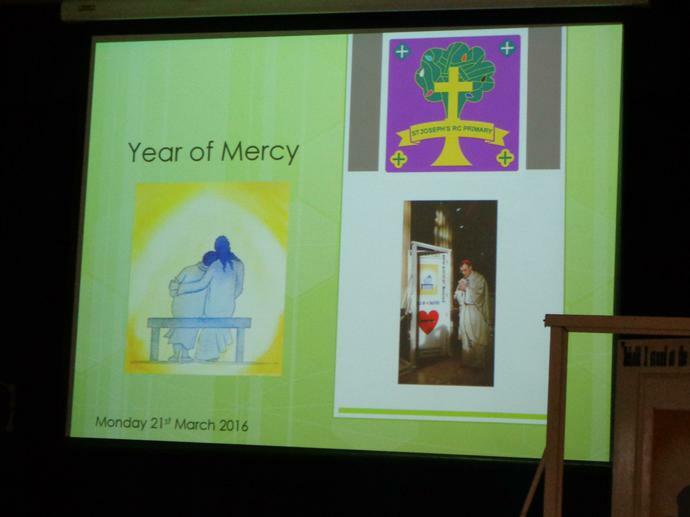 On Monday 21st February the Year of Mercy Door came to our school. 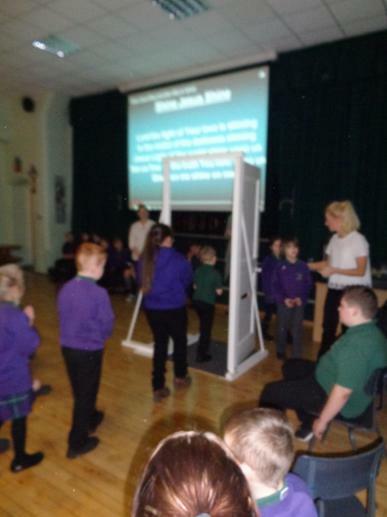 We held a special assembly and each child walked through the door. 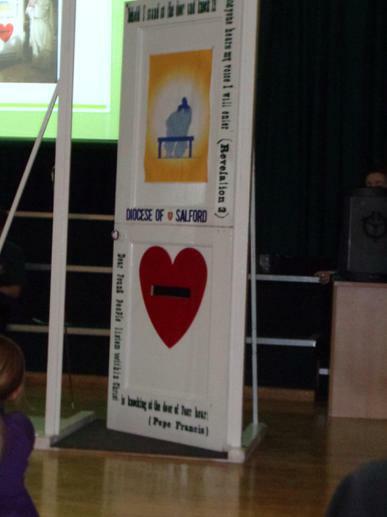 The door is travelling to every school in the Diocese of Salford. In Rome Pope Francis has opened a door as part of a special year that he has declared. We have been learning a lot about the Year of Mercy, we have been encouraged to spend time in reflection and prayer during this jubilee year so that individually and as a diocese we can grow in appreciation of God's mercy. The Church since 1300 has celebrated a Jubilee year every 25 or 50 years. Jubilee years are associated with justice, liberty and the release of debts. The Year of Mercy is an extraordinary Jubilee Year (not fitting the 25 or 50 year pattern) and Pope Francis says he has proclaimed it "as a special time for the church; a time when the witness of believers might grow stronger and more effective." Through celebrating this year, we can grow in our understanding of God's love and bring the message of God's mercy to the world. 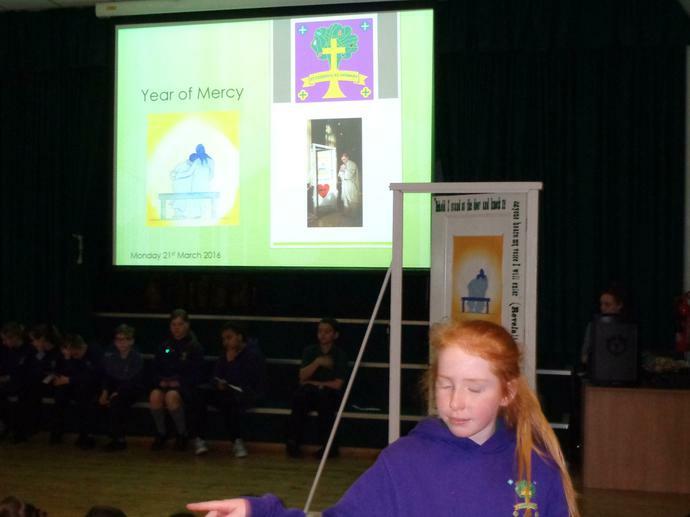 Our school Prayer Leaders are leading on The Year of Mercy. They have written an action plan which includes work in the community as well as leading prayer in school. and to teach us how to forgive one another. Pour out Your Holy Spirit upon us. a journey back to You. that they are beyond Your love.